The Australian Schoolboys have wrapped up the two game series against the touring England Academy side with a 50-12 win at Southern Cross Group Stadium this evening. Despite trailing 12-10 early in the first half, the Australian side never looked threatened scoring 40 unanswered points. The final game of England’s tour proved to be a fiery encounter with both sides having to be separated on numerous occasions. The teams were reduced to 11 players in the final 10 minutes, with two players sent off and two sent to the sin bin. 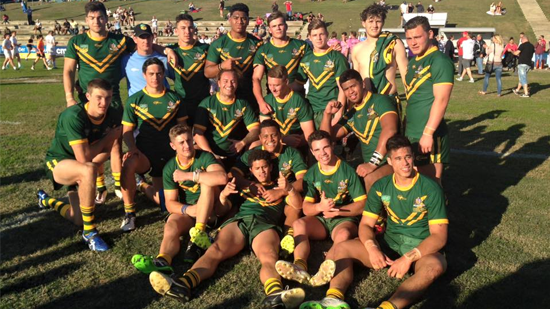 Australian Schoolboys 52 (Nick Cotric 3, Lachlan Lam 2, Tui Afualo, Dean Blore, Zac Lomax, Michael Tupou tries; Sean O’Sullivan 7/9 goals) def. England Academy 12 (Josh Ganson, Mikolaj Oledzki tries; Morgan Smith 2/2 goals) at Southern Cross Group Stadium.